For this year’s Baltimore Comic-Con, I finally decided it was time to ditch my old-school PVC-pipe booth display monstrosity and go for one of them new-fangled retractable banners that everyone seems to have nowadays. I figured it would be a good time to whip up a completely new banner image as well, and the next few Bonus Material posts will show the various stages of the art process for that image. I did a bit of research before starting the thumbnails and I found that the most striking banners I saw were the simplest. Generally, a single figure pops much more than a group of characters. But with RUNNERS, I didn’t really think that approach would work, given the heavy emphasis of my series on the motley crew of different aliens. Just showing one or two of them wouldn’t really get that across. 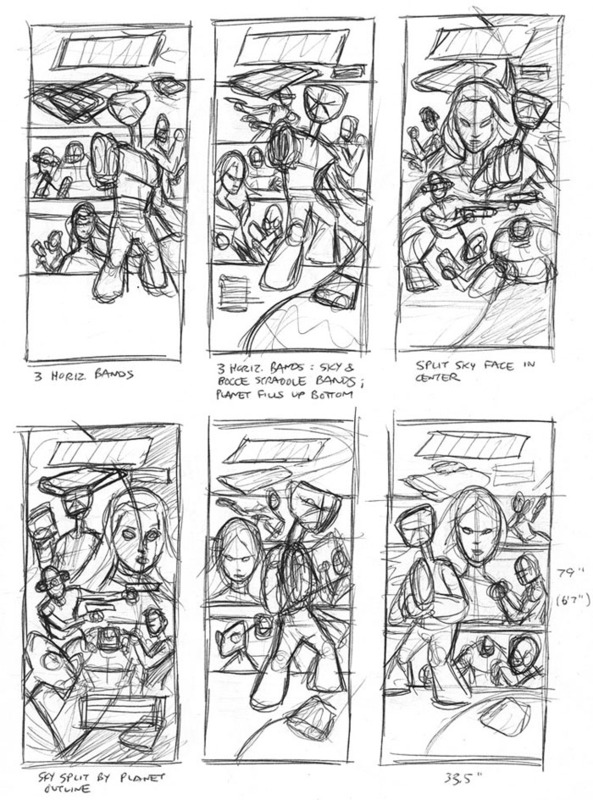 I also felt I needed the ship in there to make sure it came across as a sci-fi series, so I basically went into the thumbnails knowing it would be a pretty busy piece of art. For the most part, I stuck with variations of one full-body character (Roka), surrounded by all the other characters. I did toy around with a couple Drew Stuzan-y compositions (#3 & 4), but they just ended up compounding the already busy look. Ultimately, I decided to settle on one of the full-body compositions since I figured that full body would at least give the banner a strong focal point. I really like the three horizontal bands in the background and especially liked the idea of certain characters breaking the borders of their own bands and spilling over on top of others, just to add a bit of visual flair. I also knew I wanted a good chunk of the bottom to be relatively empty of important art since that area would tend to fall below the eye line of a con attendee once the banner was set up behind my table at a show.